Aetna wanted to show how they take a different approach to healthcare in America – starting with smoking cessation. Most messaging to date ranges from threatening, to depressing and dark, to scolding. But what if we positively message people to consider quitting. For every cigarette you smoke, it costs you 11 minutes of life so giving up a cigarette could give you back 11 minutes of life – and we wanted to make them memorable. So we brought this idea to life through a machine we called Machine 11. It invited lucky passer-bys to trade in one cigarette for an 11 minute experience. These were fun, touching moments ranging from playing with a pile of puppies to having an improv session inspired by your life. 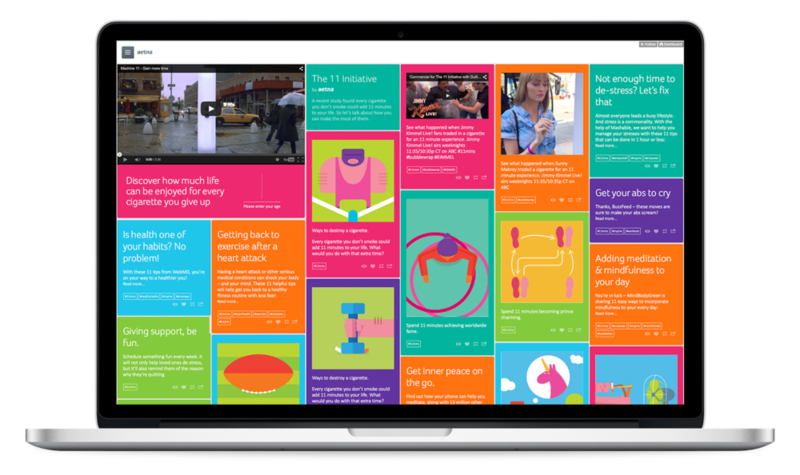 Our videos, fun content, factoids about quitting, and social engagement was all housed on an Aetna Tumblr page that became the hub of the 11 Initiative. Then the machine made it to prime time and took a journey to the west coast where we had a segment on Jimmy Kimmel Live, which has a viewership of 2.78 million. There his sidekick, Guillermo escorted fortunate machine users to a incredible bubble wrap laden 11 minute experience. We even had a famous Viner there to partake in the fun. We were even picked up on Huffington Post and Unworthy. The resulting responses to the videos ranged from gratitude and appreciation of the positive message to sharing personal stories to people being moved to tears. A great reception for Aetna as a brand, trying to re-think healthcare, in an otherwise inhospitable category.